With the exception of a garlicky aioli accessorized by french fries, I am not a mayonnaise kind of girl. So when the cabbage shows up in the summer CSA box, cole slaw is not an option. At least not in the traditional sense. But over the years, this version, made delicious thanks to soy, sesame, and ginger flavors, is a standard go to. This salad is an easy lunch or dinner side dish designed for the lives of busy families. You won’t regret having a large batch of this dressing on hand in the fridge, as it works just as well for a green salad as for this one. Pre-chop the vegetables a few hours in advance of pulling the salad together to make things go faster at mealtime. Or, mix it all up and let the cabbage soften and soak in the flavors of the dressing for a few hours. Pair with rice and potstickers or sautéed tofu and its a quick weeknight meal. For maximum enjoyment, make this salad as colorful as you can. 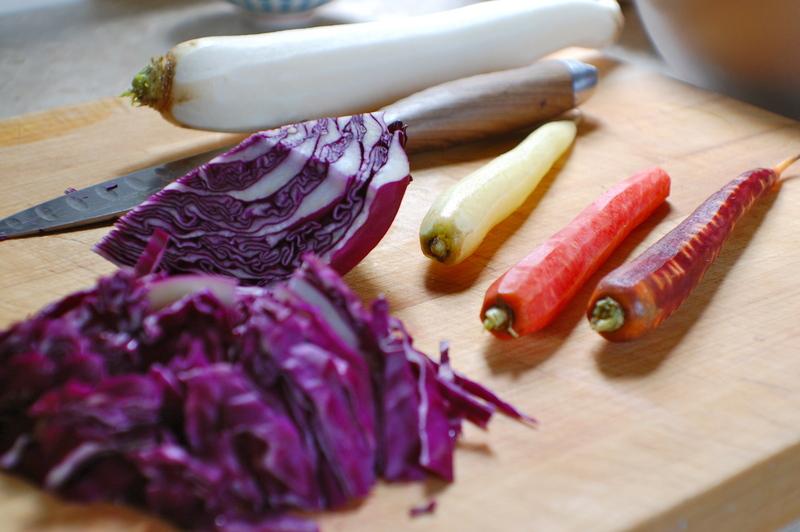 Rainbow carrots, green and purple cabbage, white diakon or turnips, black sesame seeds, dark green scallions. You get the picture. Grate a few chunks of peeled ginger (a 1-1.5 inch piece usually suffices) and 1-2 cloves of garlic (depending on their size/your taste preference) into a glass or jar. Add relatively equal parts rice vinegar, soy sauce, and mirin (Japanese cooking wine) and stir. At time , I also toss in some apple cider vinegar or a little unfiltered apple juice. Stir together and taste. Adjust balance of ingredients as needed. 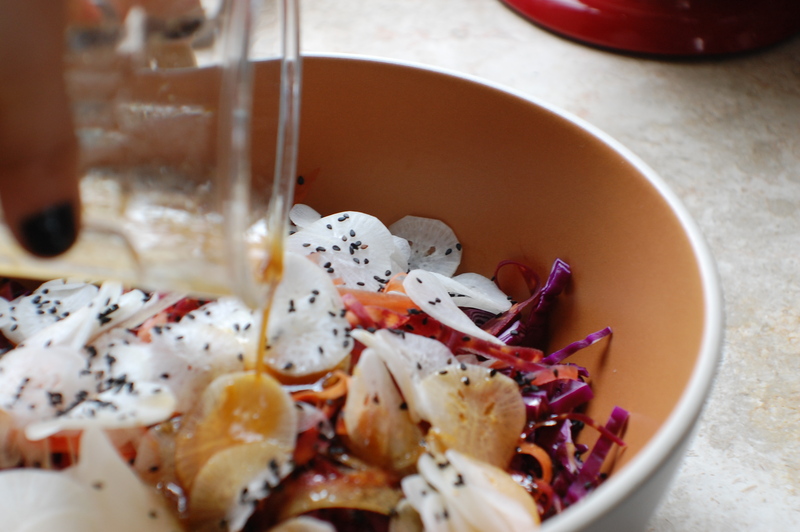 Once its delicious, add in toasted sesame oil while stirring, until the dressing emulsifies. Or, if the jar has a lid, add about the same amount of sesame oil as your soy sauce/vinegar mix and shake with lid on. Add a bit of honey or sugar to sweeten if you like. Slice into thin pieces one head of grown cabbage, or ideally, half a red and half a green. Add colorful carrots sliced or grated or in strips. 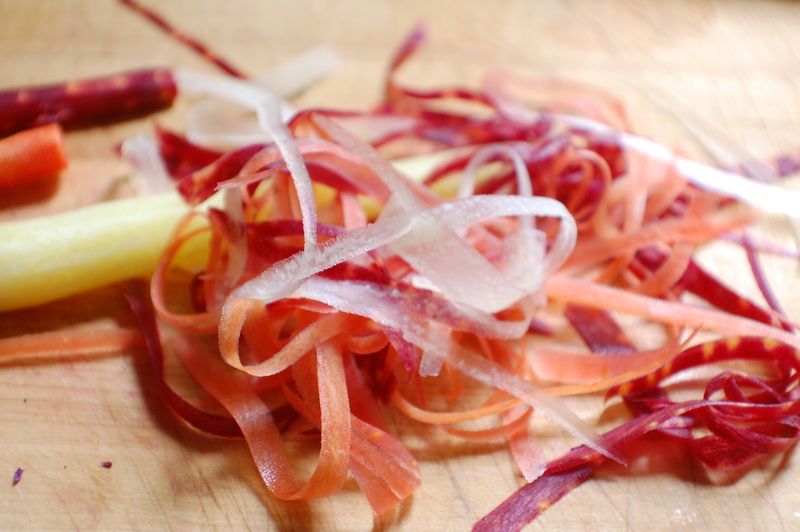 If daikon radish or Japanese turnips are available, slice and add to the salad. Add 1-2 sliced scallions, greens included. Toast slivered or sliced almonds until golden and toss in, along with a small handful of black sesame seeds. Feel free to adjust proportions on any of these as needed/desired. Toss with dressing and serve or let rest until ready to eat. Use organically-grown vegetables as possible, especially in the height of the season. You’ll taste the difference.